How to download the complete tutorial in PDF format? GIMP Forums / GIMP / General / How to download the complete tutorial in PDF format? Is there any way to download the complete tutorial in PDF format? ... Or at least, ad the tutorial to my GIMP Help menu. When I click on Help, it directs me to the online help, but - more often than not, I am unable to be online. RE: How to download the complete tutorial in PDF format? which tutorial are you looking for? As English is not my first language, I expressed myself wrongly. (I am from Croatia). What I really meant was a complete user manual that could be found on http://docs.gimp.org/en/ I would love to have the whole manual in PDF format, so I could use it offline. I do not use Windows. I am devoted to Linux Ubuntu (which didn't install offline help menu). I am not a great lover of 'buntu but I do have a LinuxMint10 on a laptop, which uses the 'buntu repositories. There are a gimp-help packages available, so start up either the 'software manager' or (preferably) synaptic package manager and enter gimp as a search. That should show up everything gimp including the help packages. A screen shot of both for reference. http://i.imgur.com/v84ne.jpg - use one or the other. Looks like the packages have not been updated from gimp-help 2.4 but you do need to check your ubuntu to determine the version. If it is gimp help 2.4 then you can also get a pdf from http://docs.gimp.org/ Scroll down towards the bottom. There is not too much difference in the basics between 2.4 and 2.6 so should be useful as a start. Tried the debian 2.6 packages in LinuxMint and they work fine so the same should be ok for 'buntu. But, installation needs a little 'tweaking'. 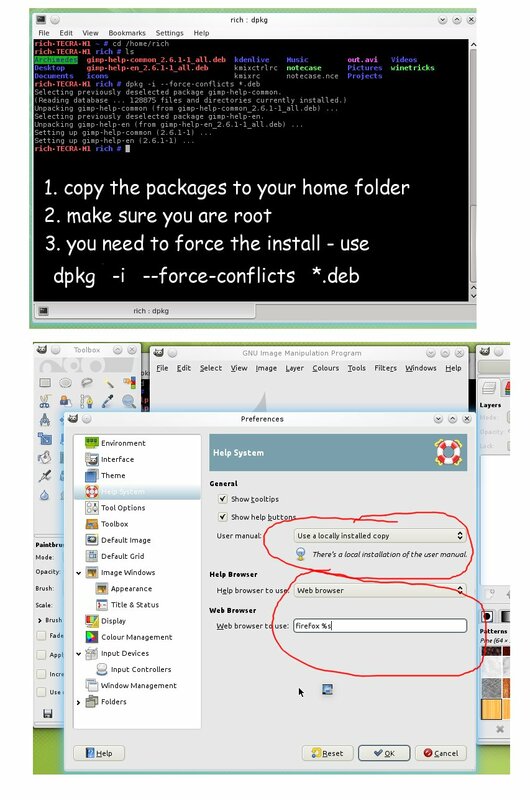 Gdebi will not install the 'gimp-help-en' package, so you need to force the install. Download / Copy the 2 packages to your home folder for convenience. That gets it installed. Now you need to set up your local help via gimp -> edit -> preferences. Thank you very much. You have helped me to solve the problem.